Looking to Introduce Woodwork into your Curriculum? Join Pete Moorhouse to engage in this inspiring and practical session. Woodwork is hugely popular and provides a rich source of enjoyment as well as learning. The impact is profound and long term. Deep levels of engagement and intense concentration are common and children often remain involved in their explorations for extended periods, impacting on the PSED skills. Woodworking allows children many opportunities including; expressing their imagination, problem solving and sustained perseverance with challenging tasks. The learning outcomes have been remarkable and encompass all areas of the EYFS. 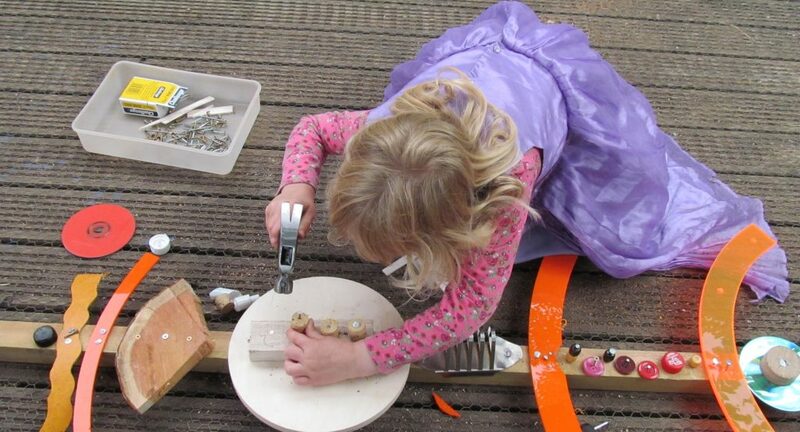 Children’s physical skills, both gross and fine motor are developed as they learn to saw, screw, nail and drill. 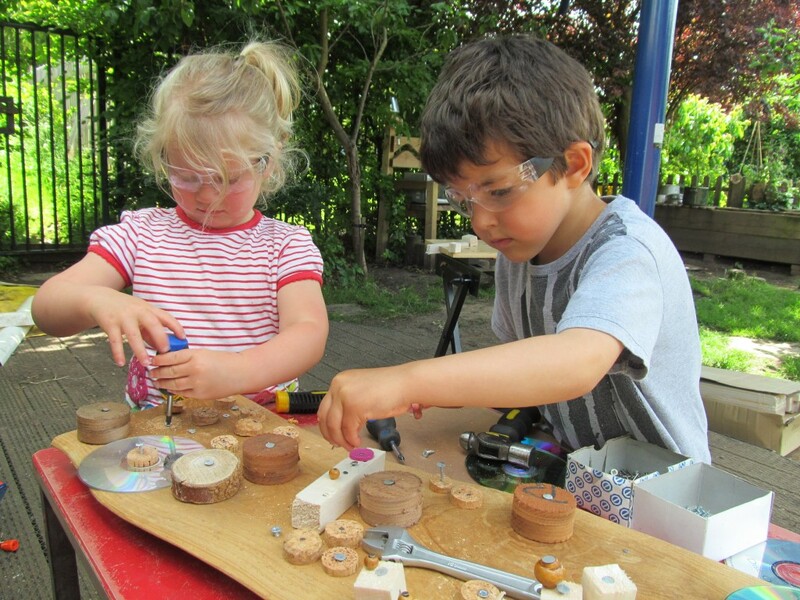 This practical workshop will look at ways in which woodworking can be safely introduced in your early years settings. We will look at the theory and how woodwork meets many learning and development aspects of the EYFS. We will examine the historical context and look at examples from other countries that have been working successfully with wood for many years. There will be explanations of the most suitable tools for young children and instruction on how best to use them. Information on potential suppliers of wood/ tools and explanations on how to set up a woodworking area will be provided. .Suggestions for activities, open-ended explorations and longer term projects will be shared. There will be a practical session for practitioners to explore the tools, gain confidence and share the experience of making creations in wood. Learn about the historical context of woodwork. Understand the potential of woodwork for creativity and critical thinking. Know where to buy the most appropriate tools and materials. Early Years Leaders, Manager, Teachers and Practitioners. Pete Moorhouse is an Artist Educator and Early Years Consultant. He is an associate trainer for Early Education and is an Honorary Research fellow at The Graduate School of Education, University of Bristol researching creative and critical thinking in early years. He is the author of several journal articles and books and a Member of ICEnet – the International Creative Education Network. To book a place, please complete the online booking form. To book on a course please complete the booking form opposite stating dates you wish to attend. If you have any further questions in relation to the course please contact Lisa Bromley, EYELA Manager lisa.bromley@pickhurst-inf.bromley.sch.uk stating the course title and date. 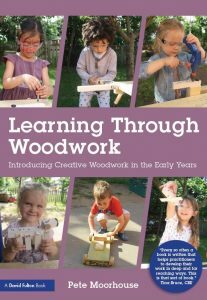 My latest book, Learning Through Woodwork: Introducing Creative Woodwork in the Early Years in now available! This essential guide provides clear and comprehensive support for those looking to introduce creative woodwork into early years settings. With theory, practical advice, stunning colour images and case studies, the book will inspire practitioners to embrace woodwork and encourage children’s independent creative learning. Focusing on the numerous benefits that working with wood offers young children, from boosting their self-esteem and problem-solving skills, to enhancing their communication and social development, the author draws on over 25 years of experience to discuss each and every aspect of establishing woodwork in the early years curriculum. Including practical information on materials and tools, staff training, and health and safety advice, this go-to guide provides a treasure trove of ideas to engage children at various stages of development, drawing the maximum benefit from working with wood and tools. Both inspiring and informative, Learning Through Woodwork will become an essential tool for early years practitioners and teachers wishing to explore and develop woodwork provision. This course will focus on how to develop children’s creative thinking. We will gain an understanding of the importance creativity plays in education and in life as a whole. We will look in detail at the experience of Reggio Emilia and their approach to encouraging creativity and independent thinking. I will present two examples of children’s explorations in depth – Woodwork and Photography. The course will conclude by looking at the role of the teacher and the importance that the environment plays, both indoor and outdoor, in facilitating creative investigation and exploration. The pedagogical approach of Reggio Emilia will be the foundation underlying all the sessions. We will gain a thorough understanding of what creativity means. Learn why creativity is so important in education and in life in general. We will look at the many factors that contribute to encouraging and nurturing young children’s creativity. We will look at the use of photography as a way of consulting with children and understand how photography can be used as a tool for self-evaluation. There will be information about the practicalities, best cameras for children, reviewing images, storage, software and how to successfully introduce photography to young children. 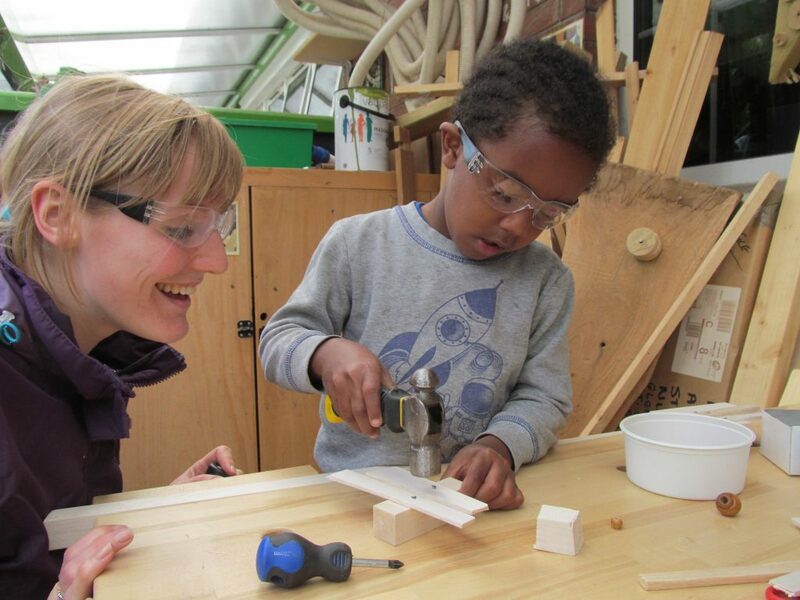 In this session we will learn all about the learning and development associated with woodwork and discover what a powerful medium it is for children’s creative thinking and problem solving. We will gain an insight into the historical context and current thinking. I will explain about health and safety issues and risk assessments and how to introduce tools safely and set up a woodworking area. We will investigate the role of the teacher in extending creative and critical thinking. We will look at sustained shared thinking and possibility thinking. We will also focus on the importance of documentation and reflective learning practice. We will also look at ways in which we can work together with parents to support children’s creative thinking. The impact that the environment can have on learning and development is profound. We will look at the aspects of the environment that play a part in encouraging creativity and wellbeing. In the Reggio Emilia approach they refer to the environment as the Third Teacher – showing the importance they place on creating the right environment for learning and growth. We will look at an environment audit – a resource that could be used to reflect on your current learning environment and plan for possible improvements. We will consider aesthetics, access to intelligent materials, opportunities for inquiry based learning, environmental factors, wellbeing and sustainability.